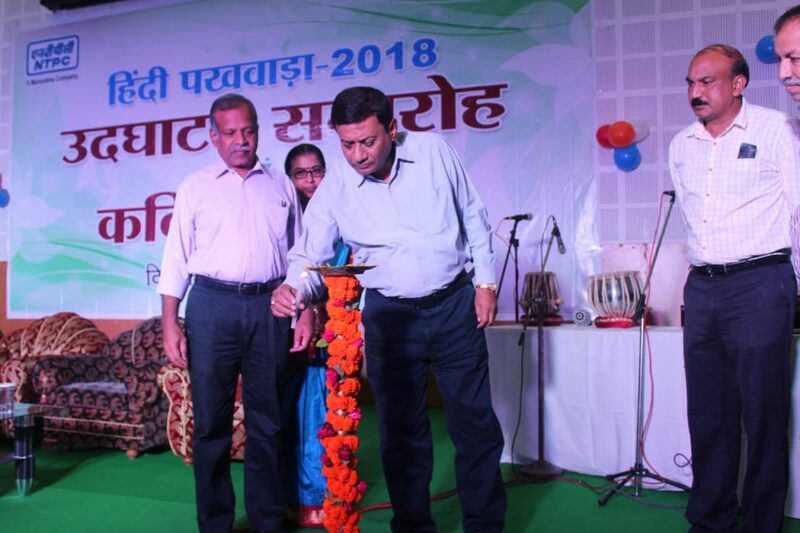 Hindi Pakhwada celebrations got underway at NTPC Bongaigaon in Assam with the organizing of a Hasya Kavi Sanmelan on Monday. Chief General Manager Dipankar Bose graced the occasion as the chief guest. The programme kick started with the lighting of the lamp by Bose along with general manager (project) O K Murukadas, general manager (O&M) Rakesh Kumar, Assistant Commandant of Central Industrial Security Force (CISF( P Balakrishna, President Bardwi Shikla Ladies Club Smt. Keya Bose and other senior members of the club and the invited poets. The programme began with the presentation of lyrical poems by Pankaj Karn from Muzzafarpur. Apart from Pankaj Karn, Ajatshatru from Udaipur, Chetan Charcit from Mumbai, Dr Manasi Dwivedi from Lucknow and Dr Kumar Viral from Muzzafarpur also took part in the programme. The people of NTPC Bongaigaon along with CISF highly appreciated the Hasya Kavi Sanmelan and thoroughly enjoyed the programme.